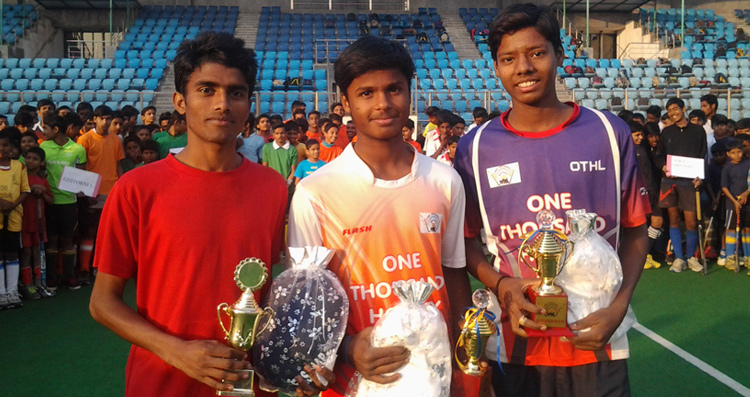 Pawan, Parvez and Sushil grab first ever OTHL Monthly Scholarship. On the eve of celebrating its Seventh Anniversary in rest of India -- and Fifth anniversary for Delhi Chapter -- the much acclaimed and innovative One Thousand Hockey Legs announces a Monthly Scholarship Scheme (MS) for its outstanding youth stars. Well-known trio of Delhi OTHL viz Pawan, Parvez Alam and Sushil Chauhan get the distinction of being first batch to get the 3-year OTHL-MS. The main parameters by which the trio were selected include a. playing hockey at school for five years, b. showing consistency in their game, c. Ability to have commitment to both Education and Sport (hockey) and, significantly d. Thoroughly gentlemanly behaviour on and off the field. The MSS entails the recipient a monthly cheque of Rs.500 to each for full three years, which will be useful to meet their sundry expenses as they move from school to college. All the three are now in 12th standard, and will be moving to college in five month’s time. Pawan and Sushil are from the stable of Government Boys Senior Secondary School Saket while Parvez belongs to historic Anglo-Arabic Senior Secondary School. OTHL introduced hockey in these schools in 2011 out of six schools. Lanky Pawan, 17, is an established defender though his lithe frame would deceive against his solid game. He is good at anticipation and quicker in clearance. He is also a good asset in penalty corner drills. He has the distinction of playing both Sub-Junior and Junior National Championships. He has won gold at Nehru-Dhyan Chand Cup, Cairns Cup and very recently gold in the 33rd Mota Singh Memorial Cup. Stout Sushil, with a baby face, is another deceiver for casual onlooker. He is excellent in distribution, motivating team and showing fighting spirit. This defender’s solid ground hits are delight to watch. A commerce student, he is very good at studies. He has played Sub-Junior Nationals twice, won gold at the Nehru-Dhyan Chand Cup, Cairns Cup and very recently gold in the 33rd Mota Singh Memorial Cup. The duo played stellar role in establishing Saket, a township in south of Delhi a vibrant hockey centre. Both have also won Silver at the Inter-Zone. Parvez Alam, 16, is now in eleventh standard, and has been a livewire of his school team. Anglo-Arabic School, of which he is captain too, recently won the first Anglo-Arabic Inter-School Hockey Cup in a tough field of 16 teams. Being an inside forward he helped team to strike goals with his athletic, all round game. Besides, he manages the team with care and caution, twin factors that got the MS.
All these boys were given a scroll, trophy and the cheque while Delhi chapter celebrated its fifth anniversary last week end at Shivaji Stadium in New Delhi. OTHL wishes these three role models to continue excel in studies and sport, and go places in future.